Build an Electro-magnetic Field Detector! Electro-magnetic fields are all around us, but are usually invisible and silent. 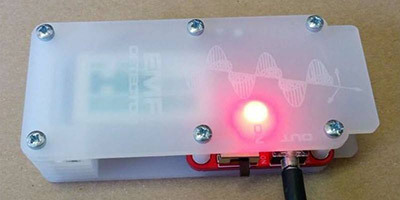 In this workshop on Thursday, 1 December, you can make your own detector to hear them. This detector uses two inductors to give a stereo audio output of the noise created by electro-magnetic fields. This is useful for investigating electronic circuits, checking power supplies, and investigating the unseen world around us. At this workshop, you’ll build your own electronic circuit to detect changes in local electro-magnetic fields. The kit includes all components, PCB, headphones, and enclosure. Along with building the kit, you’ll also learn how to solder and how to get the kit working. This evening workshop is on Thursday, 1 December, from 7:30 until 10:00. Tickets are £12 and now available on EventBrite. Don’t miss this chance to hear the unseen world!